We did ancient Rome yesterday. The kids liked the Colosseum best. 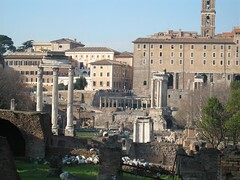 But I was enchanted by the Forum. How many great buildings and their architects have been influenced by what was built there?